Look like it's almost certain for the next Galaxy S5 to have a higher than Full HD screen (and using Super AMOLED technology), but Samsung doesn't want to stop there and is already considering even higher resolutions for the future. If you though HD720p smartphone were already more than good enough and that Full HD 1080p screen in a 5" smartphone simply doesn't make sense, you'll want to ready yourself for the upcoming Galaxy S5. That smartphone is expected to have a 2560x1440 resolution (560ppi) and it should put your eyes to the test. I think a Full HD resolution still makes sense for smartphones. 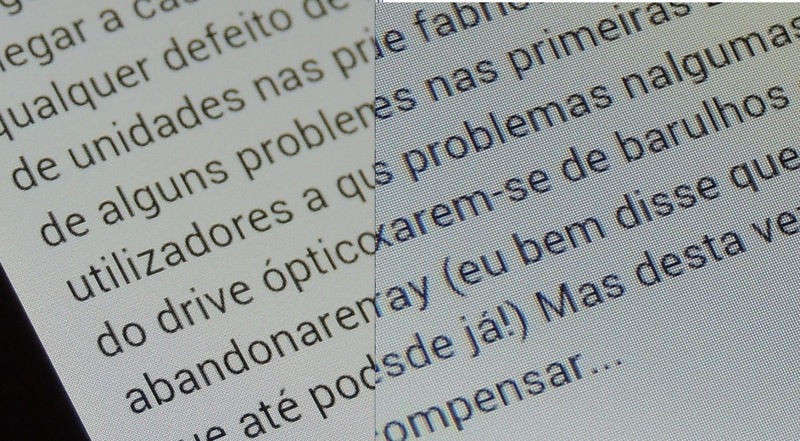 As you can see in the photo above, it is easily noticeable while reading text (720p vs 1080p) - but I concede that the jump from Full HD to a 2560x1440 will be less noticeable... and more so when it comes to even higher resolutions. Assuming the rumors are true, Samsung is already considering 3480x2160 (Ultra HD 4K) SuperAMOLED panels for smartphones, resulting in a mind blowing 860ppi. Looks like there's a race going on, and it won't take long for someone to claim the first 1000ppi smartphone screen! ... And just "yesterday" I remember looking at a 300dpi laser printer prints and saying just how incredible it was to have such a detailed output. Now, we have screens that easily surpass that and will soon approach high quality offset printing quality! Resolutions of 2560px and Ultra HD in a smartphone - does it really make sense? What do you think?